After that I headed to a few creek mouths by the islands and got smacked. I set the hook so hard I broke the cleat holding the seat back. 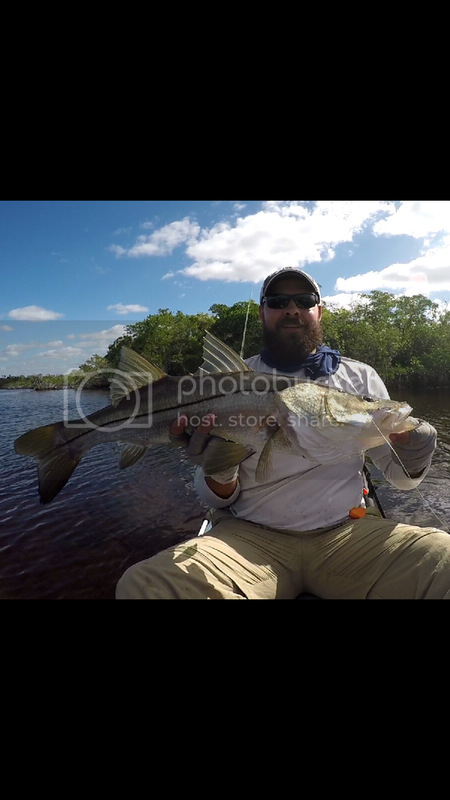 After a bunch of jumps and a sleigh ride I landed a 34" snook(best of the trip by far). To finish out the trip I headed to the head of St James creek and caught a 32" red(biggest of the trip). Quite a nice topped to a great day. Total slam of 85" best of my life. I'm glad you had a great day before leaving Florida. I'm sure you'll be anxious to come back. Those were some really nice fish. Already looking for cheap flights late February. Was really worried the red tide was going to ruin the fishing this year but it was very promising to see so many good reds along with tons on rat reds. Not so encouraging on the trout front however. Hopefully with some colder weather the trout will show up. Awesome report. thanks. Glad the fished behaved for you. From tropical did you go north or south?